Support ORC through appreciating the wild around us! No matter how many times you've been out to the Channel Islands National Park, it's never enough to fully appreciate what some have called the "American Galapagos". On March 21st the Ojai Raptor Center has arranged for an extraordinary adventure to this national treasure. 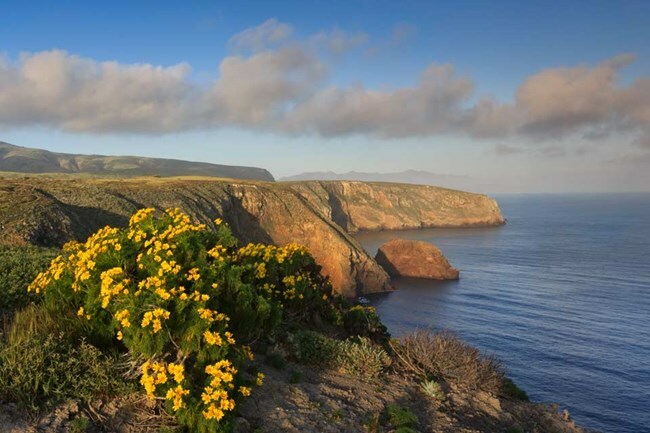 We've picked Santa Cruz Island, the largest and most diverse of the five Channel islands, for this day's trip. We are fortunate to have two fantastic naturalists to lead us...Bart Francis and Jesse Grantham. We will leave from Island Packers in Ventura Harbor, 1691 Spinnaker Drive, Ventura. Check in at 8:15, departure at 9 a.m. Upon arrival at Santa Cruz we'll have a short hike of 3/4 mile with a vertical gain of 350 feet to Cavern Point overlooking the main ship channel. We will go slowly with our guides taking on such subjects as geology of the islands, the beginnings of the National Park, ranching on the island, Chumash culture, the marine life in the Sanctuary. Of course, we'll be looking for the plants, animals and birds found only in the Islands. This will take 1-11/2 hours so we can have lunch and explore the island. The main ranch house has a great visitor center with lots of good information. We will leave the Island at 3:30, arriving in the Ventura Harbor about 4:30. Bring comfortable walking shoes, windbreaker or jacket, hat, water, sun screen...and your lunch. With these fabulous guides, this will be a great trip. This is a fundraiser for the Ojai Raptor Center, so we are asking for a donation of $150 .